There are 14 goats in this applique pattern. The quilt in the photograph above measures 35" wide x 39" long. The goats are sewn in a combination of raw edge appliqué and satin stitch appliqué. This pattern is only available to be mailed, (not available as a PDF pattern). The goats pattern made up in blocks is easy to assemble. 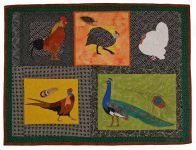 If you think outside the box, you could make a quilt using these same drawings, arranging the goats in a scene in a field, like the cows or sheep patterns. 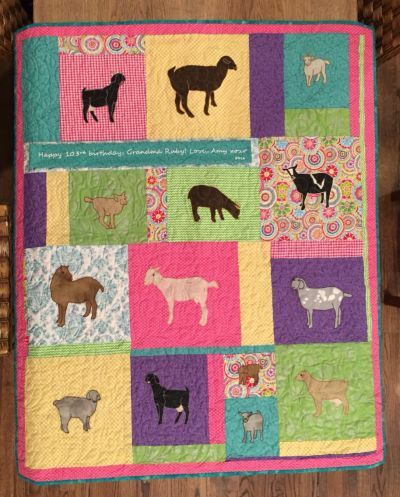 This quilt was made by Amy McDowell of Houston, for her grandmother who loves goats.